Someone once told me, we can do all the science we want, we can do all the agricultural research for development we want, unless if our findings get “out there”, the research is a useless spending of public funding. And “getting it out there” is not just publishing in scientific journals, but “getting it out there” through open access, giving each and everyone access not only to our research findings, but also to the insights of our research process, inviting discussions already during the research process itself. In that philosophy, social media plays an increasingly important role, as we have proven in our CGIAR research in the past years. And this goes also for conferences like the World Congress on Agroforestry: For us, the communications team, conferences are not a goal, they are a means. A means to advocate for our causes, a means to include of remote participants into the onsite discussions and presentations, and also a means to build capacity amongst participants, our partner organisations, and youth in the use of online media and social media, for science communications. Core to the social media outreach at #WCA2014 was a group of 135 social reporters from all over the world. Around 110 social reporters supported us remotely, and 25 of them were onsite. 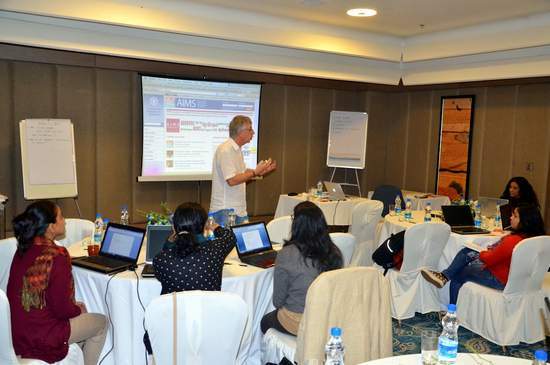 Fifteen social reporters followed a two-day social media induction course just prior to the Congress. Many of them came from the “traditional media”: the print media, radio or TV, and had little exposure to online media, leave alone, social media. Coming from a traditional media and journalism background, Beena wrote the following blogpost about her first “adventures in social media wonderland”, the challenge faced in using a plethora of social media tools, and the challenges to “communicate about science without being a scientist”. New to online science communication? “Please don’t lose your heart!” This is what seasoned social reporters told me in the corridors of the World Congress on Agroforestry (WCA) in Delhi. The can-do camaraderie generated amongst online communicators saved the heart of CGIAR online newbies, like myself, who were ready to learn and contribute to live reporting (or social reporting) from the Congress. It was heartening to see how a small group of dazed professional communicators, assembled as online newbies, transformed themselves into spontaneous online communicators in a couple of days. Peter Casier, the WCA2014 social media coordinator, guided us through the process: “I know several of you struggle real hard to find a sense, a flow, and a schwung in your blog post. But your blood, sweat, and tears is worth it!”, he exclaimed the first day. And as Peter loves people who love social media, he guarded over us like a hen guards its chicks. Peer learning and interaction with communities of practice boosted the secret drive of the social reporters at the WCA2014. The group of trainees, based in Asia and Africa, wanted to assimilate into the world of social media for a professional cause. They knew adoption of a fast-emerging medium will also fetch them more dollops to butter their daily breads. These communicators and online writers, of course, were the quintessential lot with adequate skills they have honed over the years, with a fair share of stumbles and successes. Above all, they had the love for reaching out to tell more stories in the interest of humanity. Some of them, overdosed by traditional communications, were trying to rehabilitate into professional bloggers and hashtaggers. Casier, an online communication expert, offered buckets of wisdom in a two-day social media boot camp set-up as a precursor to the Congress. It was in the boot camp I had met half a dozen enthusiasts from the CGIAR family dedicated to communicating science. Social media is one thing. Social reporting is a different thing altogether. Blogs and Twitter, the main official online media, chosen for social reporting for the Congress could have been somewhat new and awkward for some professional communicators. Some needed a little push to rekindle their interest in instant communication. A few others (like me) with no science background had to muster courage and energy only to listen to the scientists who tried to explain their findings in serious languages in less than 10 minutes in a packed auditorium. Breathless! After the painful listening was over, the question was: What to do with the learned ramblings they had uttered during the training, which we had so dutifully jotted down or captured in gadgets? Chase a panelist on tree fodder and animal nutrition after a breakout? Thank You, done! But a young scientist from the Indian state of Mizoram must have found my question how the villagers in rugged terrains do to get their daily supply of animal fodder too simplistic to answer. He described the landscape of North-East India instead. After the third attempt, he politely said that he would improve his presentation in the future, as I clearly did not get it. My pain: How to ask the right question on a subject you hardly know anything? Look for audience in help? A nice tip! I tried when a female audience urged the panelists to walk extra miles to advocate their findings for actions and criticized their shy and neutral approach. Content for a blogpost? Follow a vocal audience! Even a better tip! I grabbed a Filipina scientist-turned-activist who is married to an Indian. She wanted the scientists to become advocates and more, something like God! Content for a blogpost? To be or not to be an advocate is an individual choice. Not all scientists have the aptitude and incentives to opt for trendy communications. Publishing in scientific journals is one thing; publishing online in blogs or on Twitter or Facebook is another game. More scientists, especially from the social spectrum, are appearing online to storify their findings. This is helping sell science better, inform funders about the good use of their money and create the impact of researches, say senior managers of agroforestry institutes. Dr Sandeep Sehgal, assistant professor on agroforestry based in Jammu of India, acknowledges his student who opened his eyes to social research and the importance of online communications to get the message across. He had contributed “Scary Trees” for a blog competition in the run-up to the Congress. An increasing number of scientists, researchers, science writers and publishers with a knack for instant, crisp and convincing narration have joined social communication channels to bridge the gap between ‘serious’ scientists and ‘fluffy’ communicators. This has given a fresh spin to innumerable campaigns—seen online even on casual clicks—to generate awareness about natural resource management, its effects on daily lives and the future for humanity. What will happen to our dear traditional forms of communications then? I believe they will continue to bring sanity to online media!